Pet Sematary is yet another onscreen adaptation of a popular book by Stephen King. In fact, this is the second adaptation of the particular book after the 1989 film of the same name. Yours truly has neither read the book nor watched the first movie adaption, and thus, the blank slate helps form objectivity towards the new film. 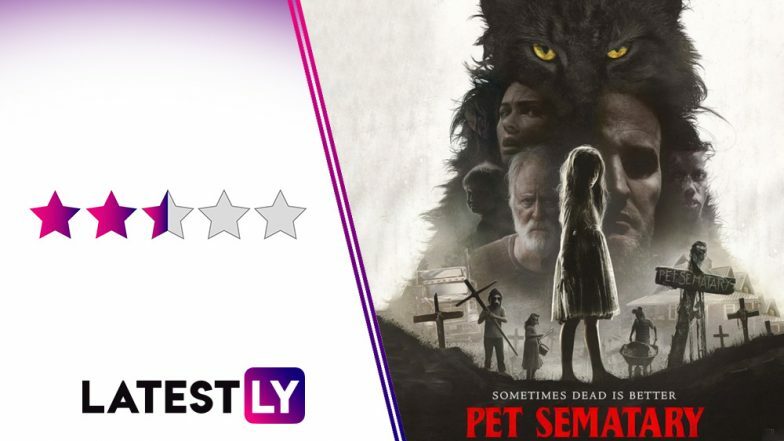 Directed by Kevin Kölsch and Dennis Widmyer, Pet Sematary is a story about grief blended with some scares. Although not succeeding at it but at least it tries. Us Movie Review: Lupita Nyong’o’s Stupendous Performance Backs Jordan Peele’s Crazy Vision in This Horror Thriller. Louis Creed moves into a quaint town with wife Rachel and two children, pre-teen Ellie and baby Gage. They have a pet cat, Church, named after Winston Churchill. On the very first day, they are greeted by their old, friendly, widower neighbour Jud, and the titular 'Pet Sematary' - a cemetery where town's kids bury their pets. Over the course of the first half, we learn that the burial ground has powers to bring back the dead to life. "Sometimes dead is better," Jud warns. When life takes away the family's most precious, the father goes against the laws of nature to revert things to what they were. Goosebumps 2: Haunted Halloween Movie Review – The Horror and Comedy Lie in Just How Unsatisfying the Movie Is. Pet Sematary fails to sinks its teeth into the obvious theme of grief here, first of all. With so much material to play with the movie only dabbles with the idea. It tries to be the slow-burner emotional tragedy but it only contributes to a slow pacing rather than an engaging story. I just don't know why movies use non-horror jump scares. Pet Sematary uses trucks as jump scares twice in the narrative which is proof how little material it has in the first half to actually produce good scares. Pet Sematary is the classic case of everything that the trailer shows. The movie takes way too much time to go beyond what we have already seen in the promotional footage of the film. The first half of the film could have been crisper and it could have come to the point quicker. Credits where due, the last fifteen minutes of the film are truly horrifying. I wish those final minutes were stretched out more in the screenplay. Also, all the actors Jason Clarke, Amy Seimetz, John Lithgow with the kid Jeté Lawrence have played their part incredibly well. If you have seen enough horror movies to know the clichés, Pet Sematary is a dull affair. Although, for the ones who are only occasional viewers in the genre, the movie might be pretty enjoyable.